It’s taken me some years, but I’ve finally found an IPA that I really like to drink more than one per sitting. 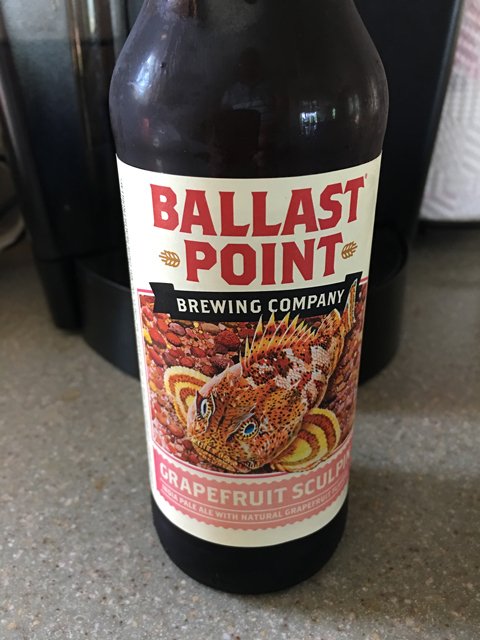 Ballast Point has created the Grapefruit Sculpin and it goes down very smooth with less of the bite or bitterness that some more popular IPA brews normally have. At 7.0% ABV, it’s double the alcohol content that your average grocery store beers have, which is nice that you don’t need to get filled up to get a nice buzz going for the evening. The grapefruit flavor is not sweet or over powering at all. It compliments this IPA brew like no other fruit-infused beers – including most lagers and pilsners – have done before. This beer is widely available in all 50 states and I’m sure in other parts of the world. If you’ve not tried one yet, even if you are not a fan of IPA, see if it’s a beer you like. If not, at least you could say you’ve tried one. I was really excited when I nabbed my first couple of Ballast Point cans. Yay, new microbrew! Only to discover it really isn’t, per se. Ballast Point was acquired by Constellation, one of the biggest distributors around next to EnBev. BP is the scourge of the microbrew world because they’re looked at as sellouts who still claim to be the proverbial “little guy.” Their flavoring techniques are all chemical instead of actual items like pink grapefruit, etc. kinda disappointed. I didn’t realize they used chemical flavorings instead of the actual fruit citrus. That is disappointing. Seems the acquisition hasn’t been kind to BP. Might have to find another microbrew that’s true to it’s brand and flavor.